FIBREBOLT® consists of a pultruded stud with threads cut in a glass mat reinforced outer layer (the center of the stud is unidirectionally reinforced for high strength) and a molded nut. FIBREBOLT® does not possess the thread shear strength of steel, but has sufficient strength to be a viable alternative in structures where fastener corrosion is a concern or where metal fasteners are not permitted (antenna housings, computer equipment testing structures, etc.). FIBREBOLT® fiberglass studs and nuts are ideal for applications requiring mechanical fasteners that must be non-corrosive, low in conductivity and/or transparent to electromagnetic waves. The studs are machined from pultruded vinyl ester rods and the nuts are thermoplastic. 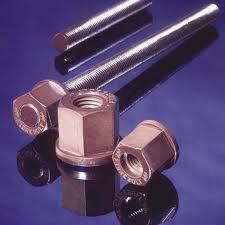 The studs and the hex head 6-point nuts come in 5 sizes, 3/8", 1/2", 5/8", 3/4" and 1" , Color: Brown. Contact us for more information on these and other great fiberglass products. Already know what you need? Request For Quote.